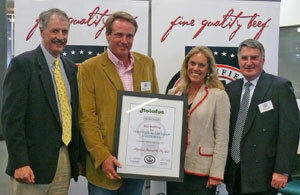 Irelands was awarded the John Wilson trophy for the most successful exhibitor at this years Royal Melbourne Show. 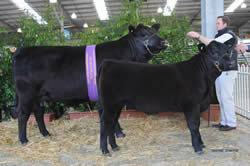 Exhibiting 6 head the Ireland’s stud from Wagga was successful in all sections. In the bull section the 17 month old Ireland’s Eldorardo E6 was named Junior Champion with 11 month old stable mate Ireland’s Enviro E71 being named the Reserve Junior Champion bull. The Junior champion bull was described by Judge, Jack Woodburn as a powerful unit, packing 776 kilograms onto his frame and with an eye muscle area of 109 centimetres square and 11 and 7 millimetres on his rump and rib. Stable mate Ireland’s Enviro E71 weighed 598kg at 11 months with 98cm of eye muscle. Both bulls were described by Associate Judge, Leisel Sargent as extremely consistent and structurally very correct. The Ireland’s also exhibited the Reserve Senior Champion cow Ireland’s Blackcap C21. Blackcap is a 2 and a half year old heifer who had an impressive 5 month old heifer calf at foot by TeMania Infinity. The Ireland’s also exhibited the best three head and pair of bulls. Highbank Pastoral Co, Young NSW operated by Nick & Fiona Cobcroft have picked up 2 major accolades in the CAAB awards presented recently in Melbourne. The awards were for highest marbling and best overall conformance. The result comes from over 50,000 head processed for the CAAB program. Highbank have used Irelands angus bulls for many years now with great results including this major achievement. Again this is proof our program is working and is measured by our client’s great success. Genetic strength at work.